Just Say No to Hospitals! Hospitals are examples and metaphors for the iatrogenesis of our entire provision of health care. Posted in Healthcare Reform, Uncategorized Tagged Hospitals, Iatrogenesis No Comments on Just Say No to Hospitals! It’s easy to get wrapped up in the heat, intricacies, and excitement over the politics, economics, and technologies of Health Care (and Healthcare – know the difference). But you know what? We still need brains and hands to do important work. It’s important for the right kinds of brains to enter life-long nursing and medical careers. Right now, however, we are approaching a catastrophe in education – and from two ends: supply and demand. Both the supply of educational resources and the demand of the new generation for serving in Health Care are decreasing. Today’s physicians don’t feel like they’re doing what they signed up to do. Today’s nurses don’t feel like they’re doing what they signed up to do. Each are fighting unnecessary wars with unnecessary people who subjugate the industry with their unnecessary idiocies. Furthermore, we not only need a new generation of dedicated, educated, and well-trained HCPs, but we also need a new – pardon the expression – industrial complex of how Nursing and Medicine work with each other for the benefit of patients. I can’t tell you how priceless it was for me to be able to attend an occasional lecture by a physician during nursing school. Yes, nursing and medicine are different fields – and there are reasons for some of the barriers between them. But the membranes that separate these professions must be much more osmotic than they ever have been. Finding ways to better inter-mesh nursing and medical education would produce more educated nurses and physicians. It may be a higher up-front cost to do, but the long-term yields would be well worth the capital. You can do all sorts of financial reform in Healthcare. You can do all sorts of things with technologies in Healthcare. That’s all welcome, of course – if done elegantly. But none of that will convey Health Care to the places it needs to go if we don’t have a running supply of nurses, physicians, and other HCPs. Slavoj Zizek wrote a book a few years ago titled “First As Tragedy, Then As Farce”. You don’t have to agree or disagree with Zizek’s mashup of Hegelian/Lacanian analytics of our Century’s problems. But, given the state of Healthcare, it’s an apt description of where we’re heading. Think about that phrase as you reflect on Healthcare today. How many times have you encountered the Farce? It’s absolutely farcical that there are Hospital CEOs who wouldn’t have the slightest clue about moving a patient from a bed to a chair. It’s absolutely catastrophic that we are entering crises of shortages of *willing, able, and supported* nurses, physicians, and pharmacists. Healthcare: First As Farce, Then As Catastrophe. How Might Healthcare Utilize Charitable Yield Management? Depending on how this test goes, I’ll update you how Pinterest might work. Posted in Healthcare Reform, Uncategorized Tagged "Charitable Yield Management", Rory Sutherland, TEDx No Comments on How Might Healthcare Utilize Charitable Yield Management? As we wind down the first year of the second decade of the twenty first century, Revolution abruptly emerges as a global topic of attention. Clearly, Occupy Wall Street is the social object du jour. It may be time, however, to think about what Revolution accomplishes. Specifically, what work does it do…and what work does it not do? If you examine the cannon of Revolution over the last few thousand years, Revolution dominates as a pattern in all civilizations, cultures, religions, sciences, etc. The work of those revolutions – in retrospect – accomplished the often difficult task of raising awareness. But they rarely – if ever – accomplished the actual lift-work required to manifest the Dream of the Revolution. No, that work has always been left to another mechanism: the Mutation. The mutation is what governs the river of biological evolution via natural selection. Evolution is not Revolution: it is Mutation. If Evolution were Revolution, the chromosomal links would break, and species would die off. It’s those tiny mutations that make just enough of a course-shift, which make giant leaps in function and speciation. This is the case with Technology and Ideology and Culture – although with a difference: these things do not evolve so much in a Darwinian fashion, but in a more Lamarckian algorithm – the idea for a gun can leap into the idea for a cannon, without having to go through millions of mutations. Cultural genes – memes – can make leaps, unlike genes. In that sense, the work of cultural and technological and ideological Revolution can take place – but only as the results of accumulated mutations. Leaping ideas (Revolutionary idea) need connected pieces on the ground to accomplish work. And so it is with Healthcare. In Healthcare, it’s almost always the case that a slight mutation of an idea leads to radical insights which lead to what we end up calling “revolutionary”. When the Hungarian physician Ignaz Semmelweis realized that a simple idea – that of hand washing in between deliveries – he generated a slight mutation in conventional medical practice. And although his peers shunned him and continued in their obstinent disregard for hand-washing, his idea became Revolutionary. …Which just goes to illustrate how true Revolution almost never happens….just the (hopefully proliferative) expression of “good” mutations. It’s this: When seeking to change an enormous project like Healthcare, you can focus on fomenting Revolution – or seek out the tiny mutations that can spread through vectors already in existence. This may be a difficult thing to accept for those trying to Occupy Healthcare. Healthcare isn’t a country, nor street, nor any single entity. It is, in fact, the results of millions of mutations. If you want to Occupy Healthcare, you can’t. …But: you can take on a few tiny ships on the big ocean so-to-speak. Everything has an opportunity cost. Might the opportunity cost of trying to create a “Healthcare Revolution” be foregoing the benefit of focusing on making one tiny mutation which could deliver better care – one way or another – much quicker? A true Revolt doesn’t take place by revolting. A true Revolt occurs over the course of tiny mutations. Posted in Healthcare Reform, Uncategorized Tagged Healthcare innovation, healthcare reform No Comments on Healthcare: Revolt…or Mutate? The Healthcare Hot Seat: What Would You do? Let’s to a hot game of chess, shall we? The current needs for health care exceed the financial resources available for them. We call that excess: debt. The debt has a price. It is called interest. It’s a compound product, this interest. You’re sick. You get care or you don’t. Multiply the last sentence by tens of millions. Multiply the last sentence by debt. Now, for the hot seat. The seat is checkered in black and white. It’s not red, but the heat is just as terrifying. You have all this capital, as derived from the above. Continue to fund care for the people who are sick now and in the future until the compounding of the product approaches infinity – without substantially changing the fundamental processes of health caring. Cut the above funding and use the capital proceeds for life science research, biomedical technologies and other branches of knowledge and sources of ability – and redirect healthcare toward detection, prevention, extension, enhancement and low-cost treatment. Choose the first and you save millions of lives, and the debt compounds upon itself and the current model of caring for the sick goes on. Choose the later and millions of lives will likely die or be put into harms way over the next few years – but the interest on the debt reverses, a new kind of health care emerges and, after a painful wait, thousands of millions of lives will likely live well for centuries. You’re in the hot seat. No, you cannot ask for the seat to be warm. No, you cannot ask for the seat to be gray. The pawns and rooks and knights are waiting. Whom do you kill and whom do you bless from the cold command of your burning throne? Posted in Healthcare Reform, Uncategorized No Comments on The Healthcare Hot Seat: What Would You do? J.P. Morgan received $25 Billion from taxpayers succeeding its acquisition of insolvent Bear Sterns, which Morgan repaid. Many of us know about the bailout. 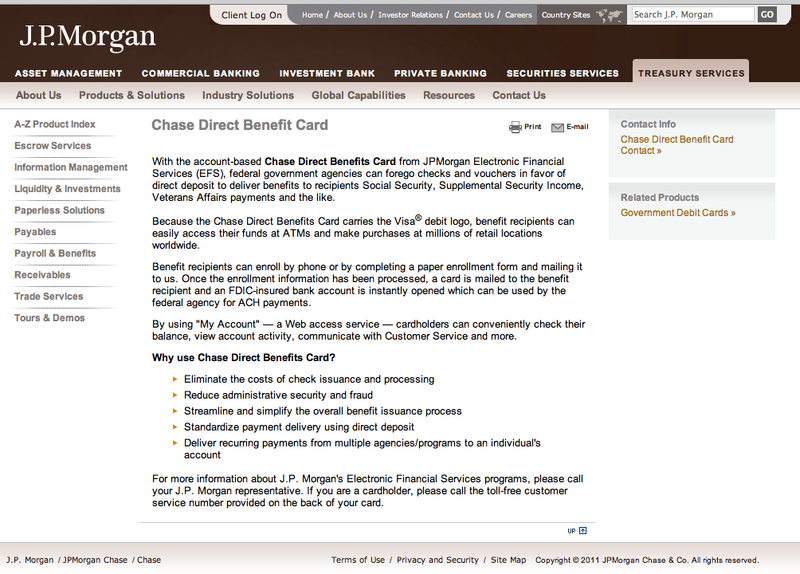 Few know about J.P. Morgan’s involvement in Food Stamps. A banking enterprise which is atithetical to any form of public welfare state – and whose industrial peers’ collective incompetence and sociopathic disregard for their own industry drove many Americans into unemployment and even food subsidies – received capital from the State, hard-earned capital which was forcibly appropriated from the People. The same banking enterprise – again: a going concern antithetical to welfare – receives state money to process welfare payments. These are two important facts to bear in mind with respect to Healthcare. Regardless of where you are on the political spectrum – from Libertarian to Communism – consistency of belief system is a must. What J.P. Morgan’s apparent conflict-of-interest demonstrates is the utter lack of moral leadership required to sustain a civilization. If you are a Capitalist, then you must remain true to the principles of Capitalism. If you are a Communist, then you must remain true to the principles of Communism. If you believe in a completely free-market approach to payement reform in Healthcare, then be true to your principles and accept whatever evidence comes your way proving or disproving your stance. And when you die, you must accept the comfort or hell of your deathbed made by the hands of your ideology. Make sure you understand Das Kapital. If you believe in a regulatory approach to payement reform in Healthcare, then articulate clearly the vision, understand the mechanics of that vision and elucidate the consequences of those mechanisms – for good or ill. And when you die, you must accept the comfort or hell of your deathbed made by the hands of your ideology. Make sure you understand The Wealth of Nations. Integrity is the soul of Health. Once it’s gone, it’s gone forever and we die into indignity. Capital is the most powerful, ramifying and mysterious substance in the world. No civilization has yet figured how to safely handle it. Capital will the be the frontline in the biggest and most destructive war of the 21st Century. Pick your side and get ready to fight. I’m with you, whatever side, as long as you hold your integrity all of the way to the heart-breaking end. Every single one of my predictions will be wrong. You can go through life not caring about your health – eat by taste instead of satiety; sit instead of walk; believing in things instead of the moment. You can also go through life obsessing about your health – constantly searching online for health products; demanding every diagnostic test, no matter how expensive or irrelevant; believing that if you do all the right things you won’t die. Both are extremes, excesses. They are also enormously expensive and uneconomical: the first forgoes prevention for future intervention, while the later diverts resources from others who need them. There’s a middle between them which Americans have forgotten. There was a time when healthcare wasn’t the financial and bureaucratic catastrophe it is now. In fact, our healthcare problems may be America’s Achilles Heal – our greatest national security threat since the rise of Fascism and Stalinism in the 1920s. Some of us paid no mind to our health. Others wanted everything possible to be done. We lost sight of the Golden Mean. Perhaps it started somewhere in the 1960s when advanced technologies saved lives previously beyond salvation, and those technologies were repurposed without deep consideration of the consequences. Perhaps it started when geniuses from Harvard School of Business or Wharton realized that the efficiencies of operations management for factories could be applied to hospitals and other healthcare facilities. Whatever the reasons, over the last fifty years, Healthcare has – bit by bit – steered away from the helm of human brains toward mechanical methods. Efficiency started to replace care…human, hard-working, committed care. I don’t know exactly where the middle is in our desire for the best healthcare. But there is a golden spot somewhere in between our Romanesque excesses and our post-war American apathy. For 21st Century Healthcare to be….well…21st Century Healthcare, we will need heavy-duty investing activity – and not just in terms of financial capital. We will need a kind of investment thinking which accounts not only for the exponential growth of technology but also for the corresponding ramifications of that growth. Much of the venture ideas we hear about basically follow this template: We’ve identified this problem and have come up with this solution. Typically, this does work: there are static problems which basically need static solutions. For instance, if you want to decrease nosocomial wound complications, build a better device that’s safer, more effective and cheaper. No need to think too deeply about the variable of time: such a solution won’t necessarily be out-dated in 18 months. For more complex and dynamic problems, however, whatever solutions that are currently viable may not be so viable in 18 months (or some other length of time in the future). A good example would be EMR. By definition, these are technologies – specifically technologies which must meet multiple demands within multiple workflows across multiple platforms and so on. It would be economic insanity to build such systems for today. Why? Because the technology alone will be outdated in 18 months. In choosing to invest in EMR, you must think exponentially. But, as I said earlier, investing in EMR doesn’t just involve thinking about technology and problems conceived as of today: it involves thinking about how the surrounding ecosystem (e.g. clinical collaboration culture, patient values on privacy permissions, etc.) can change exponentially. Five or more years ago, it would be hard to imagine that patients would share as much health information online as they do today. The relative percentage of patients sharing select medical data openly may still be rather small today. …But: if the trend is extrapolated, what might the percentage be in another five years (or even less)? What’s more, social features of EMR – at this point – are a must. Which is to say, any investing in EMR *must* account for the exponential increase in adoption of social, mobile and other technologies which will absolutely have to be embedded in the design of EMR. It would simply be either hardly feasible or expensive to add them later. This, then, makes the problem of successful Healthcare investing especially difficult and…well…more risky. And therein lies the opportunity: risk is effectively a barrier to entry, so those innovators pregnant with either capital or risk-love stand to earn large returns. That’s only fair. So investment decisions in Healthcare need to move away from a linear conception of time to an exponential conception of it. This is why all those iphone Healthcare apps aren’t making too much of a ding by themselves. …But they do demonstrate one thing: tiny enhancements in productivity and information gathering can lead to big things. That’s sort of the principle behind exponential curves – a tiny step to the right, a huge jump upward. It’s a huge social object these days, one with no solid definition. What does it mean? Reform what? Does Healthcare Reform refer to the allocation of financial resources? Does it refer to the allocation of human resources? Doest it refer to how people get healthcare information? Does it refer to how we address clinical collaboration? It can mean just about anything. Using the word “reform” assumes there’s something already formed. The problem is that there is no singular Healthcare in the U.S. – no unified system. U.S. Healthcare is not even a loosely distributed network. In other words, there’s no “form” to be re-formed. We’re dealing with something that’s rather formless. If anything, Healthcare is deformed. I’m not sure where the idea of – or phrase – “Healthcare Reform” originated. It doesn’t matter now. But since language does impact how we formulate problems and solutions, maybe we need to step away from this kind of talk. Perhaps it would be better to ask: what are the specific areas of Healthcare which are deformed? In what ways are they deformed, and what should they look like if they were to be properly formed? Simply saying “we need Healthcare reform” isn’t going to do anything. You’ll just have people compete for political interests an attention, and in the tremulous cacophony nothing makes sense nor progress. Saying “this particular area is deformed and should look like this” is a clearer start. Going down a list of what areas are deformed (and which work just fine) make understanding, idea-thrashing and problem-solving more effective. Our financial capital system is on the verge of collapsing again in the coming years – and when it does, it will be much deeper and ramifying than what happened in 2008. So give up hope of any financial savior in Healthcare. There are, fortunately, other kinds of capital. Creative capital. Network capital. Natural capital. Spiritual capital. These may seem insignificant or frivolous. They aren’t – for these kinds of capital are ultimately what financial capital depend upon. When you recognize these other kinds of capital, your eyes can open up to larger possibilities. You can even spot problems and offer solutions without any permission or dependence on governmental bureaucracy. Our Healthcare may be deformed, and our financial capital system may be deformed. That’s bad, but we can fix those kinds of deformity with time and perseverance and austerity. It’s deformities in creative, network, natural and spiritual capital which are the true enemies of what you call Healthcare Reform.